Duffus is a large coastal parish, with village, of the Laigh of Moray, extending to nearly 10,000 acres north-east of Elgin, and Hopeman is a large planned village, with harbour, while Roseisle is a purely rural area now, with a huge planted forest to the west. The small town of Burghead is also in Duffus Parish, but, with the nearby village of Cummingston, is more conveniently dealt with separately. There is a coastline of 7 miles, sandy to the west, but elsewhere rocky, with cliffs and caves, formerly a great haunt of smugglers. Much of the parish used to be under water, partly from an arm of the sea stretching inland eastwards from the Roseisle area, partly from the great Loch of Spynie. A mighty sand-blow, of the Culbin variety, cut off the arm of the sea in the late 17th century, and subsequent reclamation, with the draining of the loch by the Spynie Canal, leaves this now a most fertile expanse. The name DUFFUS means "Black Water". Duffus rose to prominence because of its great castle, built in the reign of David II, Bruce's son, on what would then be an island in the waterlogged area, a green eminence, largely artificial, with surrounding moat. The first motte-and-bailey castle was of timber harled with clay. We read of Sir Reginald Cheyne, who married the heiress in 1286, petitioning the all-conquering Edward of England in 1305, for permission to fell 200 oak trees "to build his manor of Duffus" - galling indeed to have had to win English permission to fell his own trees. This stronghold was replaced in due course by a stone keep and surrounding curtain-walling, the remains of which dominate the flat lands today as a noted landmark, and are in the care of the Department of the Environment. The property was granted to the progenitor of the great Moray or Murray family, the famous Freskin, in 1150, but passed, through marriage of heiresses, first to the Cheynes and then to the Sutherlands, in 1350 - these Sutherlands however being of the same Moray stock. The tenth Sutherland laird was created first Lord Duffus in 1651, for aiding King Charles the Second, and the line survived until 1843, when the title fell dormant for lack of accepted heirs. Long before that, however, Duffus Castle had ceased to be occupied. It does not appear to have featured largely in history, despite its size and strength, covering no less than 8 acres within its 25 feet-wide ditch, with outer and inner baileys, drawbridges, and ten-foot-thick walling, honeycombed with mural chambers. This stone castle was built well on in the 14th century, and it is interesting to note that the keep, although wide, was not vaulted as was usual but was provided with timber floors - a testimony to the great oaks which grew in this tree-growing Laigh of Moray, to make such timbering possible. 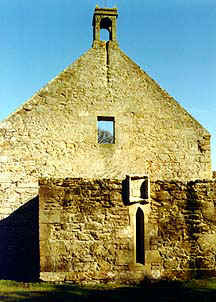 A small chapel, or oratory, was contrived in the thickness of the walling. Large sections of the masonry have sagged or collapsed because of the sandy soil of the hillock, but it is notable how the mortar has not given way, and substantial lengths of walling lean at odd angles. Much of the curtain-walling remains, and the whole gives an excellent impression of the lay-out of a typical motte-and-bailey castle, but little altered. Duffus village, old church and later mansion, lie over a mile north, on slightly rising ground. The village, once called New Duffus, is pleasantly situated, and fairly compact, although it has increased largely in recent years with modern housing. Here, at the roadside, is the present parish church, dating from 1868, quite large and handsome, with a tall spire and fairly recent graveyard. There are still some old village houses. This is not the site of the original church, which stood half a mile to the east, near Duffus House, and is now a roofless but well preserved ruin, known as St. Peter's Kirk, with its ancient kirkyard surrounding. It is a pleasant place, amongst old trees, well cared for. The present walls are mainly 18th century, but with much older work included, and a most excellent early 16th century porch, complete with groined vaulted roof. There is also a barrel-vaulted Sutherland of Duffus crypt, or aisle , to the west, which was the basement of the original tower. Here is some heraldry and a Sutherland grave dated 1626. There is a holy-water stoup just inside the main doorway, and a grave slab with an early cavalry cross on the floor of the church, with many other slabs used as paving. On the outside east gable is inserted a Latin tablet dated 1616. There are two outside forestairs to what had been a timber-floored loft, and an empty belfry. High on the south front is a stone cherub built in, and on the north walling also part of a very ancient gravestone showing a two-handed sword, plus other built-in fragments. In the kirkyard rises the Duffus or St. Peter's Cross, a typical medieval Mercat Cross, a tall slender column on a plinth, similar to that at Michael Kirk, Gordonstoun, near by. The former holy well lay at the roadside just north, but is now barely discernable. 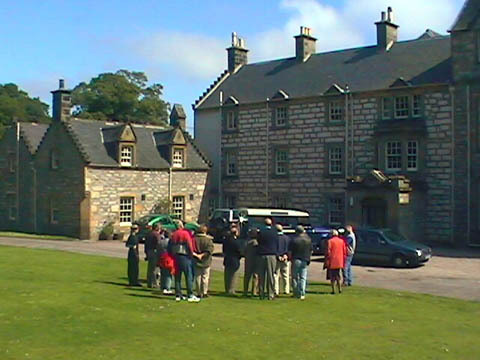 A mile west of Duffus Village is the farming estate of Inverugie, which once belonged to the Keith Marischal family, who named the property after their great lands in Buchan. There was a small castle or fortalice near the present rather pleasant mansion. To the south, in the park, is a large, rough weatherworn and cracked boulder, six-and-a-half feet high, known as the Camus Stone, and alleged, like other stones so called, to mark the scene of the death of an evidently very fierce Danish invading leader named Camus. It was formerly at Kaim of Duffus, to the south. The village, or small town, of Hopeman, lies a mile to the north, on a gentle ridge sloping down to the sea. It was founded as a fishing community only in 1805, and was much enlarged and the harbour improved by Admiral Duff of Drummuir who bought the lands in 1837. It has a rather bare aspect, lacking trees in a countryside so rich in timber, but compact, its streets laid out at right angles. Quite large, with a population of over 1,000, it lays itself out to attract holiday-makers. But its two dozen seine-net-fishing-boats still constitute its basic industry - although 120 boats once fished from here. 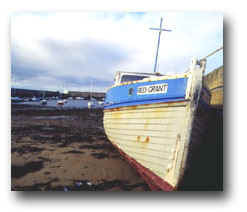 Its harbour is also much used by pleasure-craft, but unfortunately suffers from sand-silting. There is an old ice-house, with the usual vaulted roof, for the storing of fish. At the top of the little town is the 'quad sacre' church, which was the Duffus Free Church originally, of 1854, with a tall clock tower and noted landmark added in 1923 as a gift from an Elgin distiller who worshipped here. The church is large, with a gallery around three sides, but no graveyard. The village has many stone cottages of traditional fisher style, considerable modern housing, a caravan site, playing fields, other sporting facilities including a 9 hole golf course, and a Tourist Association, all above a rocky coast with one or two beaches. The renowned Covesea Caves, one with Pictish roof carvings, are usually approached from Hopeman, and the cliff-walk is very scenic. Roseisle, as its name suggests, was once an island in the great formerly water-logged area of Duffus and Drainie parishes. A ridge of hill there rises to 280 feet - no great altitude, but notable indeed in an area where the height above sea-level averages around 20 feet. To the west of this hill the vast planted Roseisle Forest extends along the coastal plain for nearly five miles, with the parish boundary more than half way. For the rest, there are only farms, and the tiny cross-roads hamlet of College of Roseisle. This ambitiously named little group of cottages stands on the site of what was once a quite important community of the Celtic Church, planted here in the early days of Christianity in Scotland. Cummingstown, a village of the parish north of Roseisle and west of Hopeman, is dealt with under Burghead. 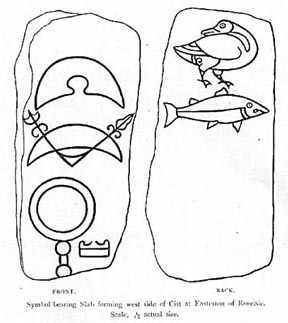 A Pictish symbol-stone from Easteron of Roseisle, depicting goose and fish sculpturing, was taken to the Museum of Antiquities, Edinburgh in 1932." All photos copyright by David Duffus - 2000.